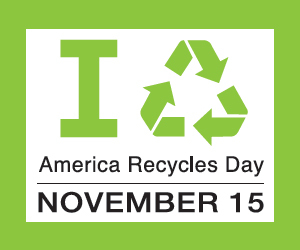 Domtar and Recyclebank celebrate America Recycle's Day this November 15th. America Recycles Day, a program of Keep America Beautiful, is a nationally recognized day dedicated to promoting and celebrating recycling in the United States. Each year in mid-November, this day is set aside to drive greater awareness of the benefits of recycling, while also encouraging Americans to continue to do more. Since 2012, Domtar and Recyclebank have worked together to further that same goal, educating Recyclebank’s over 4 million members about responsible paper use and recycling. The two organizations share the core belief that informed consumers will make more sustainable choices, which is why Domtar and Recyclebank work together to incentivize positive behavior through unique and engaging ways. Through content such as games, infographics, videos and pledges, members are encouraged to take green actions that in turn help them earn rewards such as discounts and deals from major brands. The Domtar EarthChoice Small Choices. Big Picture. sponsored content collection covers a host of topics related to paper and recycling, with everything from The Significance of a Single Tree to The Limits of Recycled Paper. In fact, in 2016 Domtar’s collection has been visited nearly 700,000 times, earning Recyclebank members nearly nine million points! Learn more about how Domtar is celebrating America Recycles Day here. Domtar Corporation (NYSE: UFS) (TSX: UFS) designs, manufactures, markets and distributes a wide variety of fiber-based products, including communication papers, specialty and packaging papers, and absorbent hygiene products. The foundation of our business is a network of world-class wood fiber-converting assets that produce papergrade, fluff and specialty pulp. The majority of our pulp production is consumed internally to manufacture paper and consumer products. Domtar is the largest integrated marketer and manufacturer of uncoated freesheet paper in North America with recognized brands such as Cougar®, Lynx® Opaque Ultra, Husky® Opaque Offset, First Choice®, EarthChoice® and Xerox® Paper and Specialty Media. Domtar is also a marketer and producer of a broad line of absorbent hygiene products marketed primarily under the Attends®, IncoPack® and Indasec® brand names. In 2014, Domtar had sales of $5.6 billion from some 50 countries. The Company employs approximately 9,800 people. To receive bite-size updates on Domtar’s sustainability efforts, along with practical eco-tips you can actually use, subscribe to the EarthChoice Monthly Minute newsletter. VIDEO | Can Sustainability ROI Boost the Bottom Line?